So, what is PFOA and should we be concerned about the nonstick pans we are using? What is PFOA? It’s the chemical used to bond the nonstick coating to the pan, perfluorooctanoic acid (PFOA)—also known as C-8. Some would argue that when your nonstick pan reaches a certain temperature, toxic gases and chemicals are released. Hard anodized fry pan features the patented Thermolon™ Rocks ceramic non-stick coating for superior food releasing properties. It’s PTFE/PFOA free and contains no silicone oil. Fry pan is high heat resistant up to 850° Fahrenheit. Suitable for gas, electric, ceramic and halogen cooking surfaces. Hand wash. It’s $39.99 at Bed, Bath and Beyond and if you have a 20% coupon, even better! Cooks everywhere, especially low fat cooks, have come to rely on nonstick pans as a great way to cook or bake food, from omelets and sauces to perfectly shaped bundt cakes, without being left with a huge sticky clean-up afterwards. In the world of low fat cooking in particular, nonstick pans are a necessity, since they require little or no oil for cooking. But not for the first time, questions have been raised about the safety of nonstick cookware, mostly because of environmental concerns about perfluorooctanoic acid (PFOA)—also known as C-8—a chemical used to bond the nonstick coating to the pan. In early 2006 the Environmental Protection Agency (EPA) asked eight American companies, including DuPont, maker of Teflon-brand nonstick cookware, to work towards the elimination of PFOA—which they labeled a likely carcinogen—by 2015. PFOA has been shown to cause cancer, low birth weight and a suppressed immune system in laboratory animals exposed to high doses of PFOA. Studies have shown the chemical to be present at low levels in the bloodstream of 9 out of 10 Americans, and in the blood of most newborns. And although the effects of PFOA at lower doses in humans are disputed, there does seem to be a link between PFOA and raised levels of cholesterol. More seriously, some people have claimed that PFOA exposure caused birth defects in babies born to mothers working at a Teflon plant in the early 1980s. How the chemical is transmitted to humans is unclear, and, thus far, there’s no evidence that nonstick cookware in particular is to blame. But DuPont has been in the cross-hairs of the EPA for some time, and was heavily fined for allegedly hiding data for many years on the toxicity of PFOA, and also for contaminating the Ohio River drinking-water supply near its West Virginia plant. Back to nonstick pans. Both DuPont and the EPA say that cooks have little to worry about if they use nonstick cookware properly. There’s little dispute that, above certain temperatures—hotter than the smoke point of cooking oils or the point where food is burned—the nonstick coating will break down and release toxic fumes. Any surface that’s subject to extreme temperature will give off toxic gases. According to DuPont, cookware with Teflon nonstick coating has a recommended maximum use temperature of 500 degrees Fahrenheit and that significant decomposition of the coating will occur only when temperatures exceed about 660 degrees Fahrenheit, which could easily happen if nonstick pans were left dry or empty on a hot burner. Cook’s Illustrated magazine (link is subscription only) reported on tests of nonstick skillets in its May/June 2005 issue, and found that such extreme temperatures could even be reached by cooking some foods on high heat (such as stir-fries). In most cases, the top temperature registered for only a second or two, falling by as much as 200 degrees as the food was moved around the pan. In 2003 the Environmental Working Group (EWG) reported that nonstick coatings “could reach 700 degrees Fahrenheit in as little as 3-5 minutes, releasing 15 toxic gases and chemicals, including two carcinogens.” The release of toxic fumes from nonstick cookware is known to kill pet birds at much lower temperatures—as low as 464 degrees Fahrenheit, according to the EWG. But while PFOA is used to bond the coating of nonstick cookware, DuPont claims that this particular chemical is subsequently destroyed in the heating process in manufacturing, and not present in the finished nonstick surface. 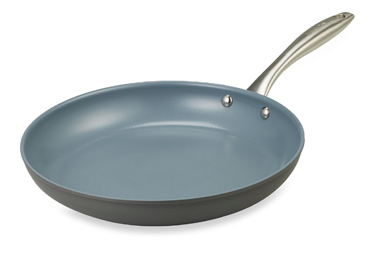 Trace elements of PFOA were found in one extreme test where the surfaces of the pans were ground up, but today’s nonstick coated pans are tougher than ever before and can withstand less careful handling than previous generations of nonstick cookware. There are two issues here: 1) whether PFOA is present in nonstick cookware, and 2) the emission of PFOA into the environment. As far as cookware is concerned, there seems little reason to toss our nonstick pots and pans just yet. Under normal use, the pans are almost certainly safe. As far as DuPont’s, and other chemical companies’, responsibility to the environment is concerned, it seems that appropriate action is being taken to ensure that emissions of PFOA will be all but eliminated within 10 years. Whether the use of PFOA in nonstick coatings and other products will be completely phased out over time is unclear, although companies including DuPont are said to be looking for suitable alternatives. Which Type of Cookware is Safest for Cooking? Al, this is valuable info. I’ve been a little suspicious of nonstick cookware the past few years. As much as I hated throwing away nonstick pans with scratches, I did that last year. Now, I feel better about it. I will check these out. Thanks for the research.